I was looking through old watercolors for tomorrow's Holiday Bazaar at The British School. i found this one painted in 2006 when I stayed on rue Vavin for 3 weeks. 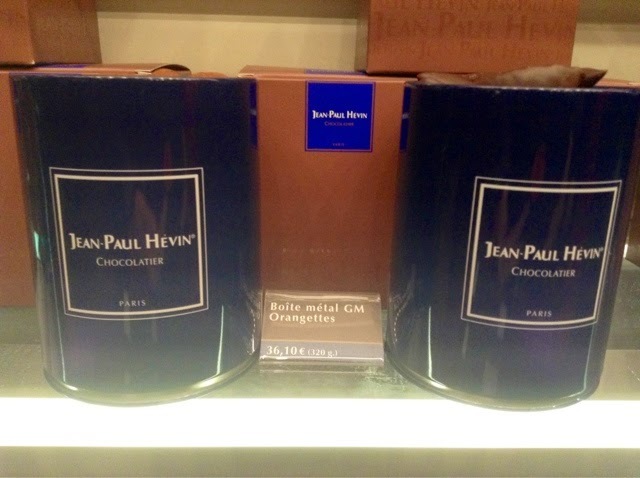 Jean-Paul Hevin's chocolate shop was down the street at #3. It became a daily source for still life subject matter. The chocolat framboise is still on the menu I'm happy to say. 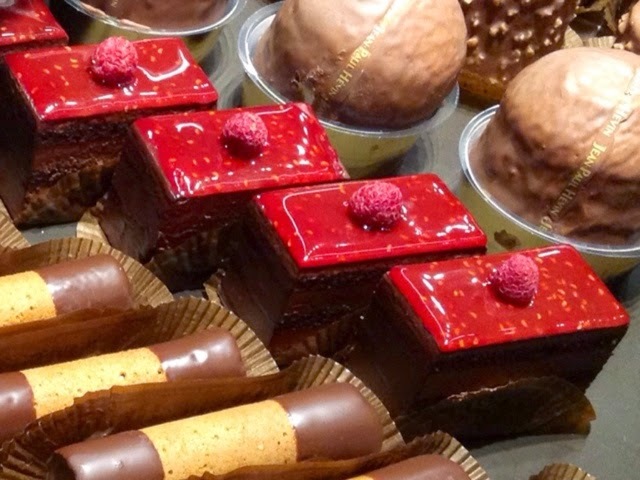 Too many patisseries change their selection so often and an old favorites disappear forever but not at Hevin. 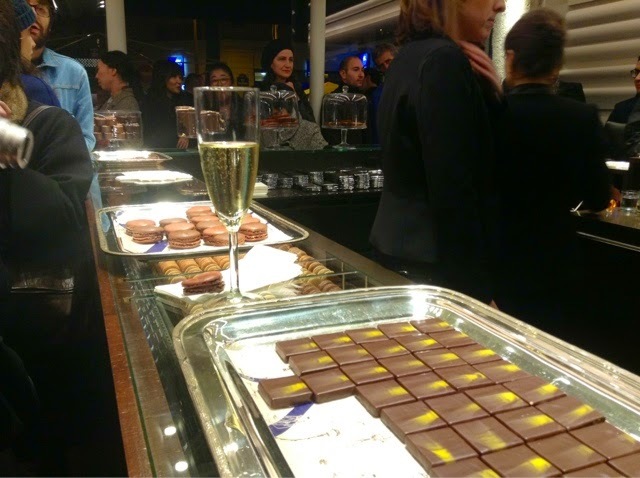 Last night was the opening of J-P Hevin's 4th shop, CHOCOLATE BAR(RE) in the upper Marais at 42 rue de Bretagne 75003, with one door opening right into the Marché des Enfants Rouge! It's 25 meters in size which makes me think I could make my 21 meter studio into a watercolor shop perhaps..? Looking through a glass darkly chocolate. These are Hevin's classic cigars of rolled cookie and chocolate ganache. Expect a witty take on many traditional sweets like his dusty (chocolate) potatoes (pomme de terre) seen above. 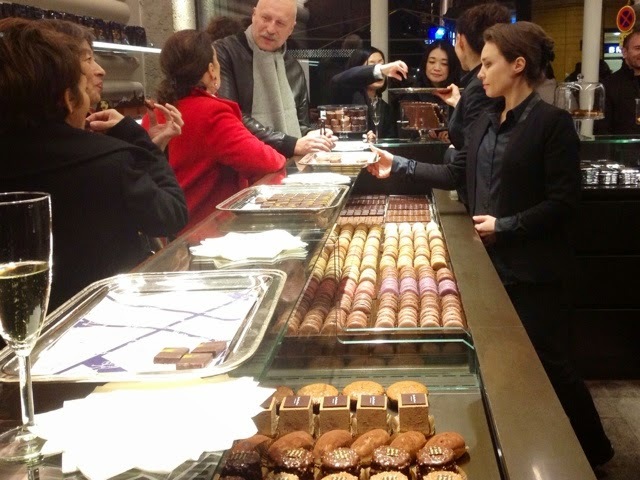 Wit aside, the quality of his chocolates are the best in Paris. All this after eating Thanksgiving dinner too. My host was disappointed I didn't eat more. Shhhh...I was saving myself. 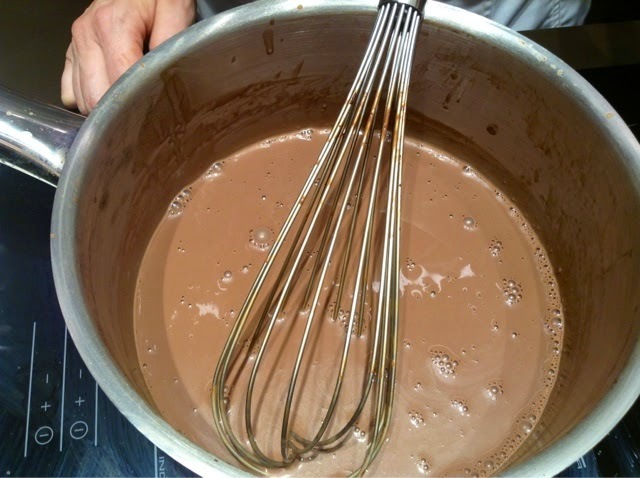 Bouché - an extra large chocolate that can substitute for eating lunch. I took Solli along for more research. 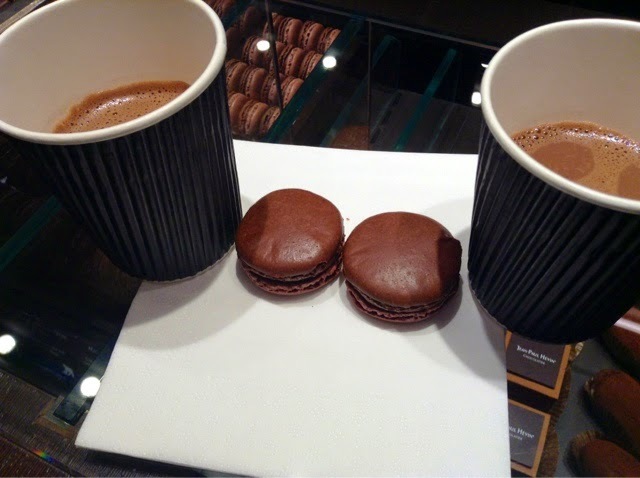 We both loved the chocolat chaud served in specially designed corrugated cups. So chic! 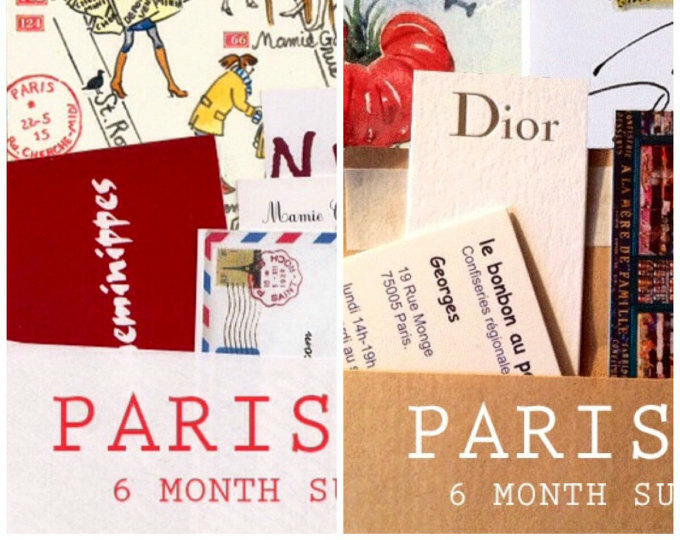 By patissiere Fabian, a 3-year veteran of JPH, who is also a fan of ParisBreakfasts! I've bought these tubes for the witty packaging but in no time at all the delicious contents were gone, gone, gone. Hevin's signature colors are terrific. In a town with too many BROWN boxes of chocolates, Hevin adds an electric blue, almost Yves Klein blue, to brighten things up. Super chic. 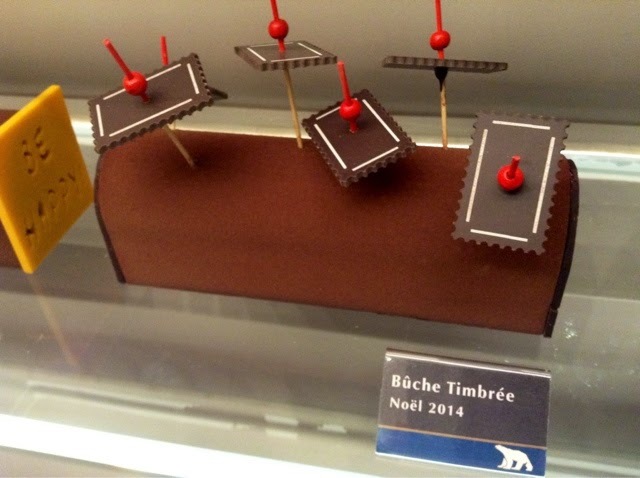 This buche with the stamps (timbre) has my name on it. 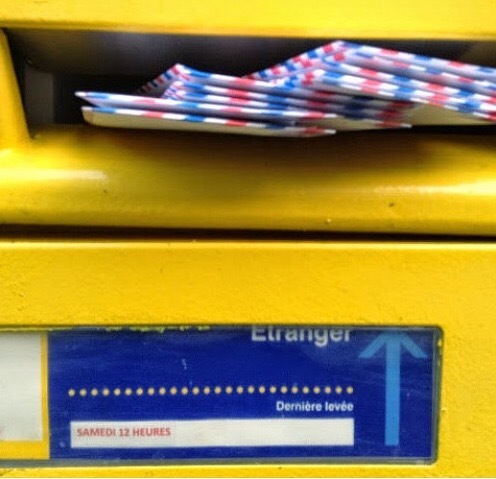 I've mailed out almost half the December Sketch Letters. 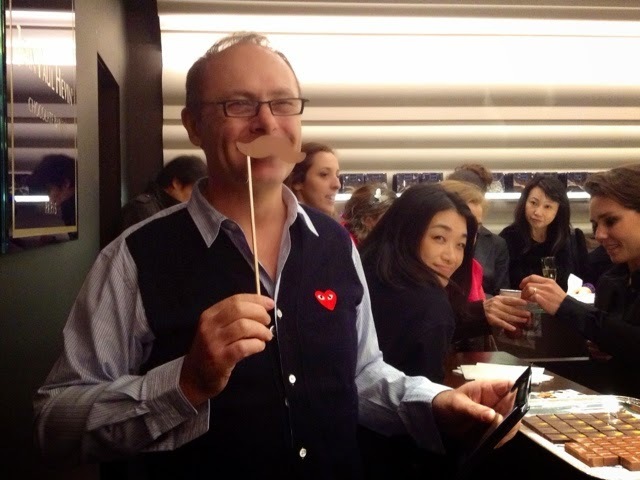 Here a very happy Monsieur Hevin goofing around with a milk chocolate mustache. 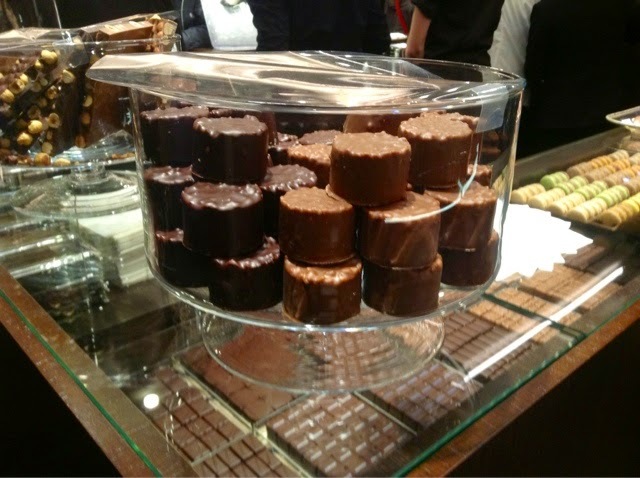 If you LOVE CHOCOLATE in any form Jean-Paul Hevin is a Must visit in Paris. And so chic. Don't forget to get one of his classy shopping bags by the way. He is certainly talented..like you..neat to know he is nice also. 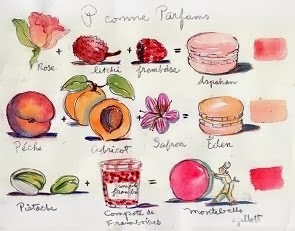 The opening watercolor is delish, too. I hope that you had a great American holiday there! Hazelnut spread in a tube instead of a jar! Cholate that looks like a potato? 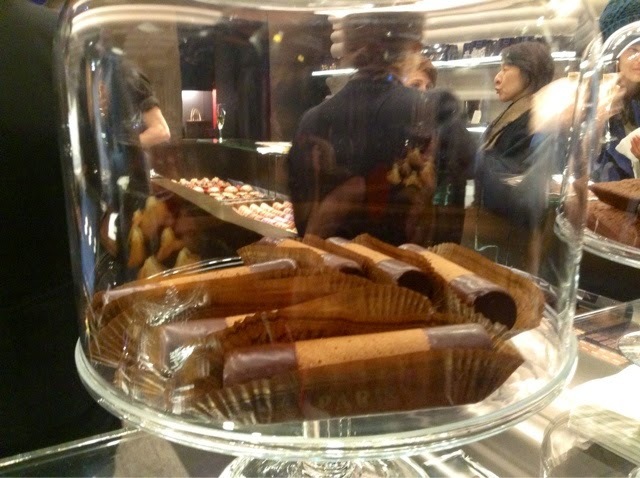 Cigars made of cookies and chocolate...my kind of cigar btw. Well Carol, as I try to get back into the NY groove, and over my jet lag, I continue with my own watercolor painting. Christmas teacup cards. Looking at all you've shown us here, I think that the Trader Joe's orange choc apple I've got cracked into slices in my frige is just letting this side of the Atlantic down. I did make a brief visit amid yesterday's chill, to take a peek at the Macy's Parade over on W 72 Street. It was sooo cold, Carol, so after taking a few photographs, and getting a bit freaked out by the low flying security helicoptors overhead, I went home of warmth. And more painting, too. How wonderful to go to the opening. I'm so glad that he has another store. 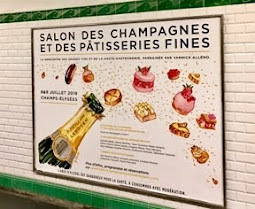 I've been to rue Vavin, and Rue Fauborg St Honore stores, and had much deliciousness every time. I can't imagine just living down the street- too much temptation. 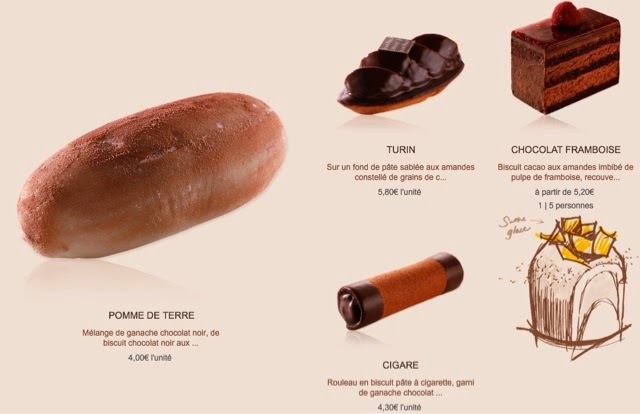 I've had that magnificent chocolate framboise, but am now regretting that I have never had the cigar- that looks intriguing. 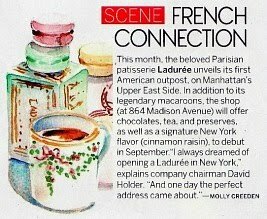 I love his macarons, and those salted caramel discs- oh my. 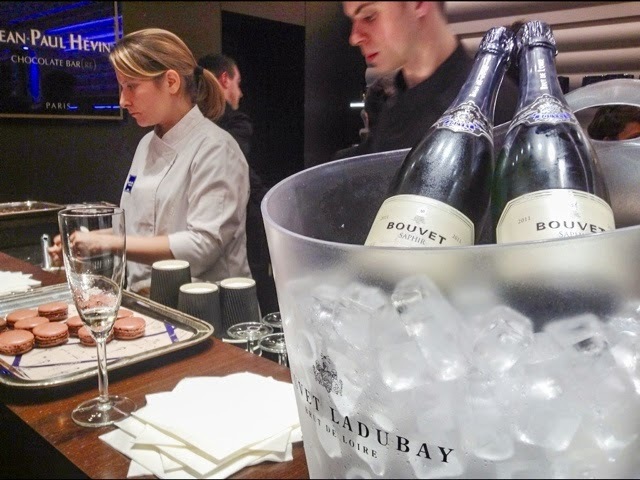 How I long to be there one year for the christmas buche(s). 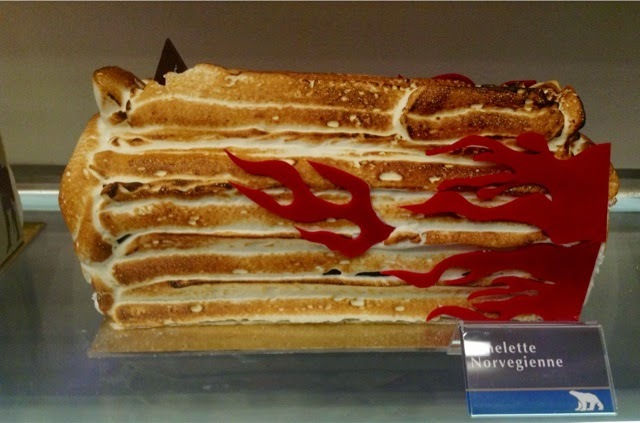 I would not be able to resist that norwegian one. Lovely post as always. Looks like Hevin is "heaven"!!! Another shop to add to my Paris list. Thanks. Hi Carol! 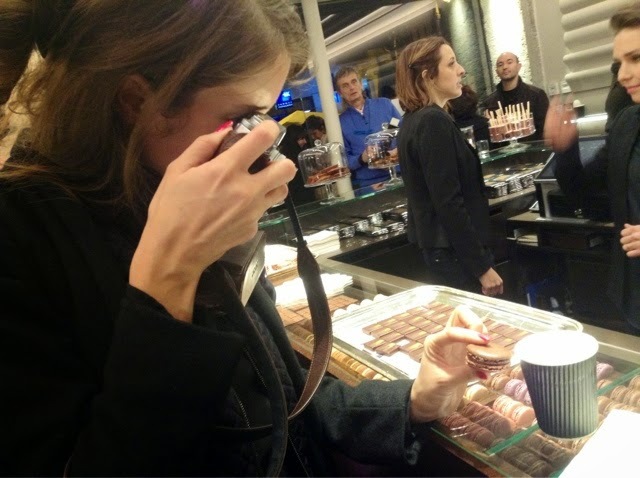 Fabienne from Jean-paul Hévin pastry laboratory writing! What a lovely review! It was a great evening for us too! I can't wait for my watercolor ;-) No pressure, I'm joking. I hope you used a tube wringer on those fantastic sauces! I, too, am completely smitten with the packaging! Why oh why did I have to look at this post when I'm fasting for blood tests? Divine! 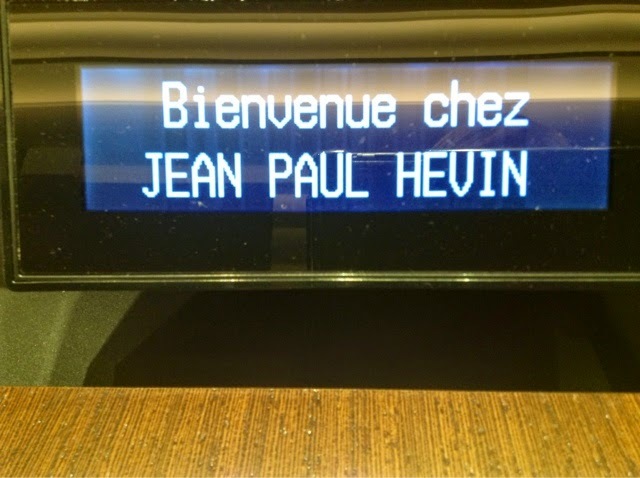 What a jolly looking Monsieur Hévin! Looked a fun occasion. 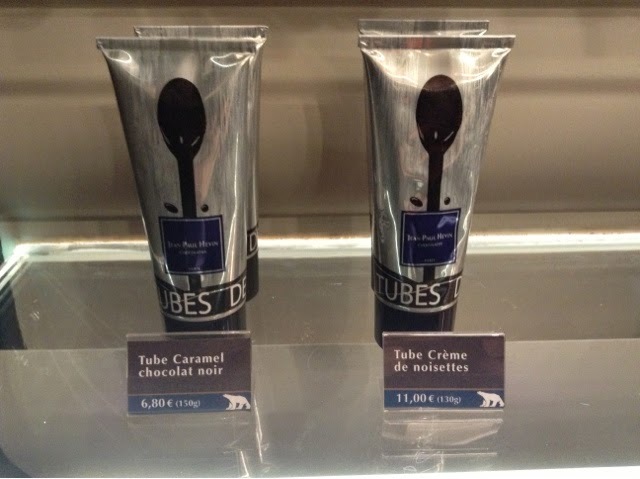 I love his chocolate bar already in rue Saint Honoré. 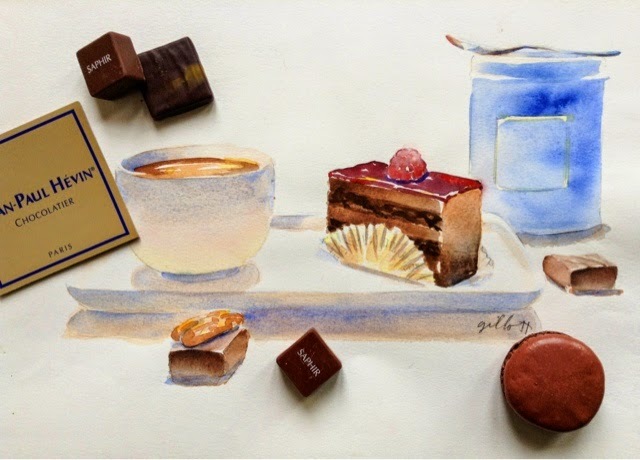 Love your watercolour with the cup of hot chocolate and cake beside it, Carol. Something so comforting, especially in this cold in Paris! 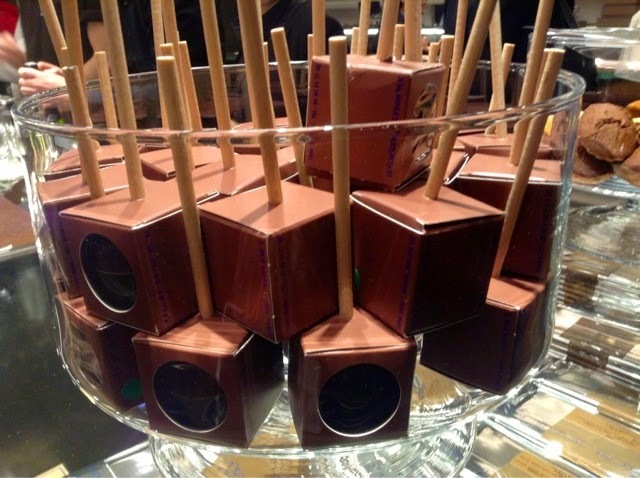 A little chocolate every day does no harm. 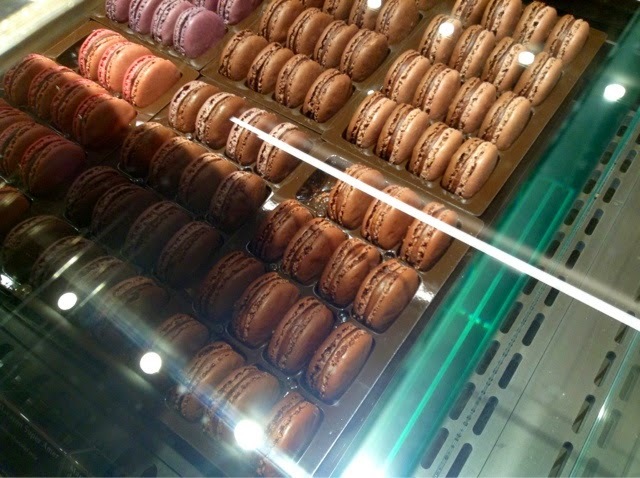 After reading about your macaron weakness I found where I can buy them and now I have a weakness also. Primarily for lemon and salted carmel. At two bucks each I am going to learn to make them for myself. Bon soir.